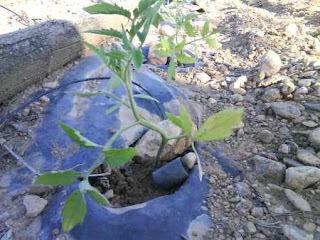 chals: First tomato plants of the year!!! This weekend I've been working in the garden for a while and I have prepared the first tomato plants of the season. Some may say it's way too soon because days are warm but some nights are still cold but I do not think they run any risk of freezing. At least I hope so. I watered them and as you can see they look perfect!!! This year the harvest is going to be extraordinary. What else? Well as you can see in the picture there are a lot of stones but the soil around my cottage is rich but rocky. Nevermind a few little stones on the way. They are a nuisance only when it comes to remove weeds. But I use plastic to avoid them as much as possible.